I love Garcinia Cambogia combined with a healthy eating plan and almost daily exercise. It helps me to keep my metabolism and my weight in check as I enter my 40s and combat changes to my life. I take these pills daily, and especially when I am going to eat a high in fat meal so break down that fat. They work well, are easy to swallow do not have any strange after effects. I love GCA, and this extract is supreme in its percentage of HCA, making it more effective. I received this bottle to help facilitate this review,but the opnions within are my own. Buy it via Amazon and Wellness Bioscience HERE!!! 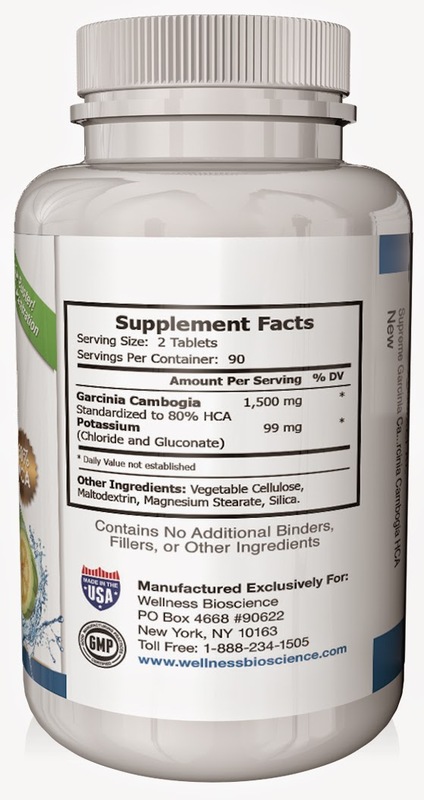 CLINICALLY PROVEN GARCINIA CAMBOGIA: Non-Stimulating Garcinia Cambogia Extract standardized to 80% HCA (Hydroxycitric Acid). Includes POTASSIUM, promoting HCA bioavailability for optimum absorption. Made in the USA in an FDA approved manufacturing facility - ensuring top quality of consistently safe and effective products for our customers. MORE THAN JUST FAT LOSS. Our Garcinia Cambogia Extract has been shown to increase Serotonin. This means it enhances your mood, controls your emotional eating urges and improves the quality of your sleep. Take control of emotional and compulsive eating by increasing your body's satiety, the feeling of fullness, with our easy-to-use Supreme Garcinia Cambogia! Wouldn't it be nice to be happier, have more energy, sleep better at night, get your figure back, and become healthier - all at once? IS THE PRICE RIGHT? You can find products for less, but they offer you MUCH less or maybe the 'product' alone. In fact, if you spend less now you'll pay more later. Our Garcinia is backed by an UNMATCHED BONUS, a free eBook that will help you set your own particular strategy to lose weight. Plus you will have a WORLD CLASS assistance through our always-responsive Customer Service. At Wellness Bioscience, you become a PREMIUM customer from day one and we will stand by your cause and stay together in your quest to shed your extra pounds according to your needs. LOSE WEIGHT OR YOUR MONEY BACK. At Wellness Bioscience we are so confident to stand by our products that, in addition to Amazon's 30 days refund policy, we also offer a no-questions-asked money-back guarantee. We consider your satisfaction NOT negotiable, therefore our aim is to deliver to you a "no-risk opportunity". Use our product for 90 days and if you are not satisfied, simply contact us and we will refund your money, no questions asked. As a small business, our number one priority is to make sure our customers are happy. Congratulations on investing in your health through successful weight loss... we are in this journey together. 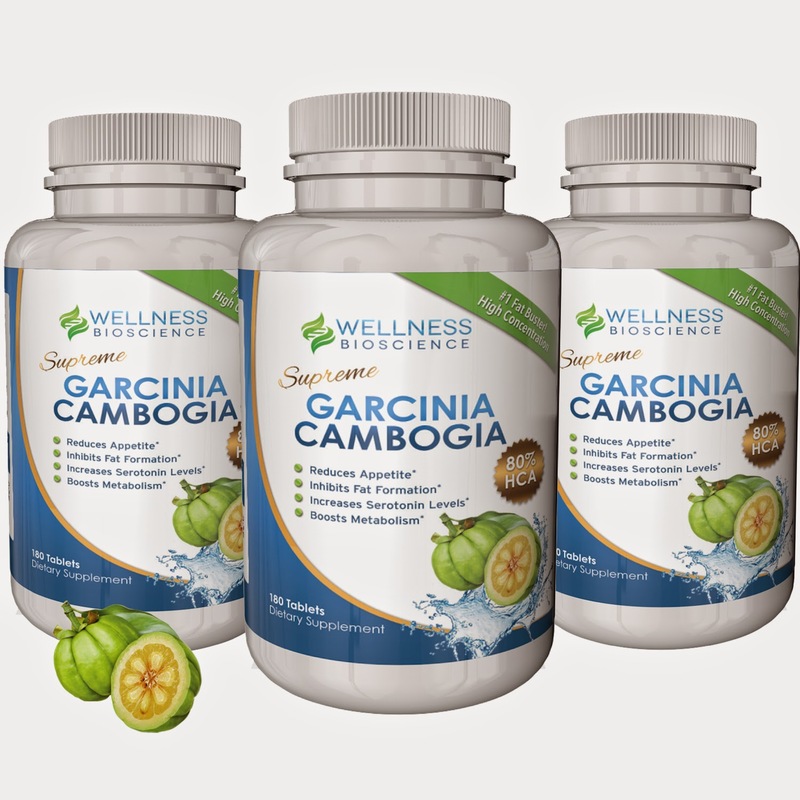 Garcinia Cambogia is a small native fruit from Indonesia. 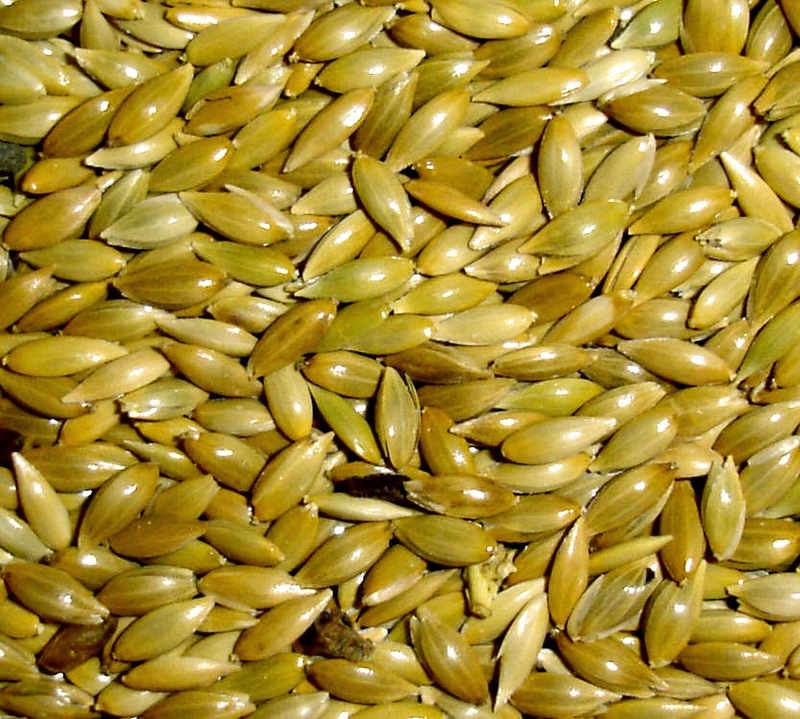 It has been used in South Asia dishes, and it was found that its use could result in weight loss. Researchers claim that its natural extract called hydroxycitric acid (HCA) can significantly increase one's weight loss results. Now it has been clinically proven to be not only effective in weight loss, but also promotes healthy cholesterol, increases serotonin levels and ultimately enhances general wellness. Look no further if you want to boost your health through curbing your appetite, improving your mood, and losing weight. The HCA helps block fat formation. It inhibits the citrate lyase synthesis, which is responsible for the conversion of carbohydrates into fat. HCA suppresses appetite by increasing serotonin levels, which is a neurotransmitter that makes you feel good and improves your mood, helping control reactive or emotional eating. Before launching this product, we were very careful to put together the highest quality pills on the market. 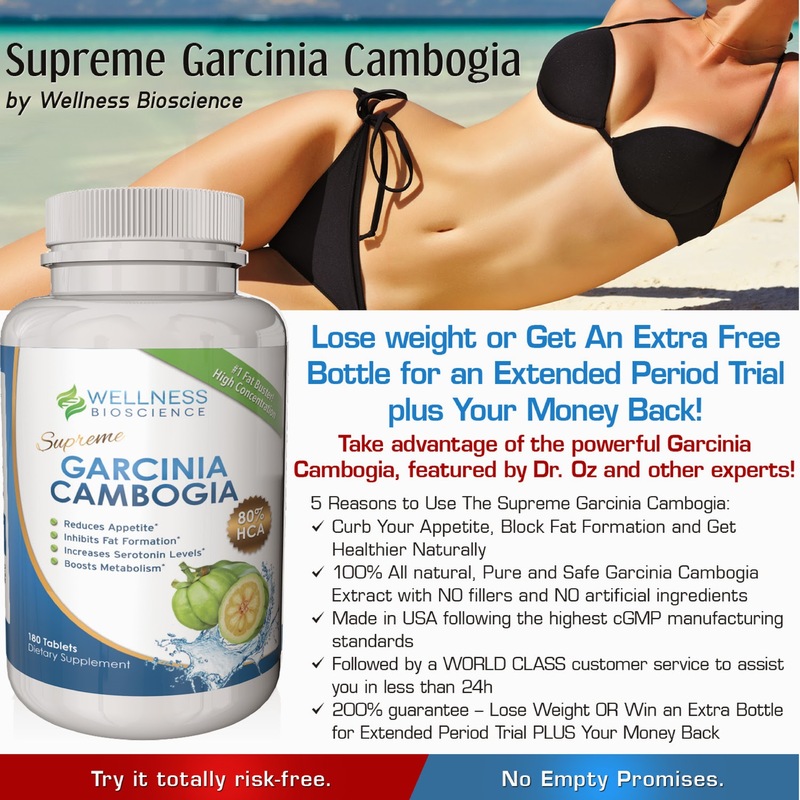 Supreme Garcinia Cambogia is manufactured in USA following the highest cGMP manufacturing standards, under strict laboratory-controlled procedures to ensure optimum potency, purity and efficacy." It works for me, why shouldn't it work for you?? I have always wanted to learn how to make my own natural, organic beauty products, soaps and scrubs. And give them for presents at the holidays and birthdays. So, I jumped at the chance to review this delicious Organic Raw Unrefined Shea Butter from Ghana in Ivory. After receiving it (and it came such a nice sized order straight away from Amazon) I set about looking for recipes and ideas to make shea butter gifties. I found an online wholesale site and ordered some basic scents and containers. I have never experienced raw shea butter, but have always bought it with ingredients mixed in from a major company. I was thrilled to receive this organic butter and make recipes with it. The first thing I decided to do was order a bunch of first grade or grade A fragrance to make shea butter creams with as presents for my friends and family. I took a poll on fave scents and ordered a few from a wholesale supplier including almonds,vanilla ,lavender and other pleasant basic scents. Then, I ordered a couple of little plastic containers to mix the shea butter and scent and coconut oil in. (I love natural oils best). It was easy to use, arrived in a timely manner and worked well with my ingredients. Top quality and organic, just like it should be. I highly recommend this Shea Butter. • 16 oz (1lb) of Pure Organic Unrefined Raw Shea Butter from Beauty By Shea is made with extra care to ensure you receive the purest Raw Shea Butter. "Beauty By Shea Organic Shea Butter is double filtered, first in Ghana, and then at our US Lab where it is manufactured into our 1lb bricks, packaged into our heat sealed bags, and sent straight to Amazon( thereby preserving the natural richness, and purity of the shea butter for our customers). Beauty By Shea 100% Ivory Organic Raw, Unrefined Shea Butter is imported directly from Ghana, and is 100% pure and natural, nothing else added! 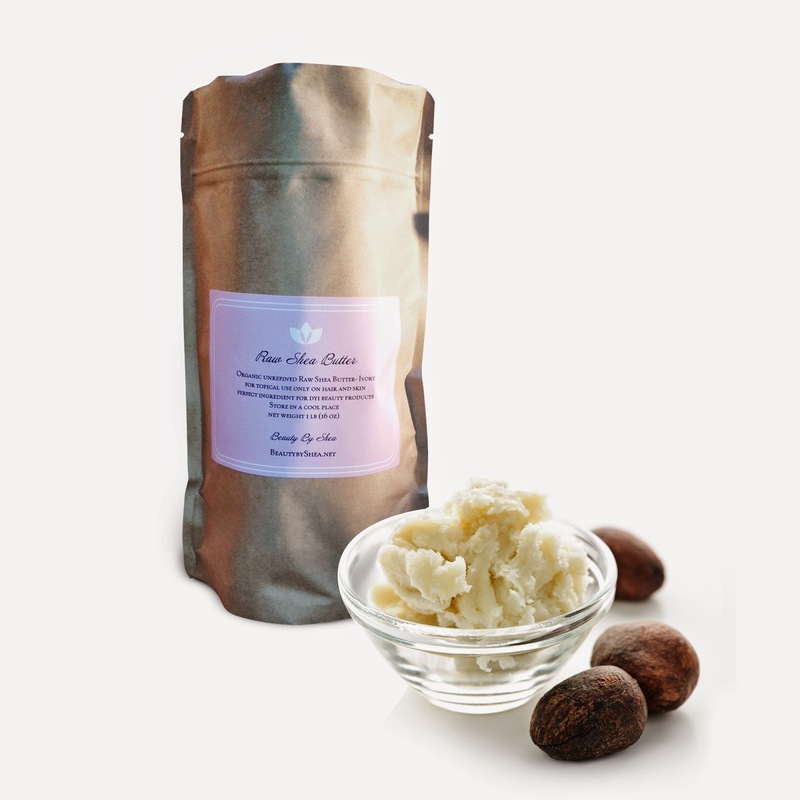 Naturally rich in essential vitamins for beautiful skin, Beauty By Shea Organic Shea Butter will nourish your skin with Vitamins A, E, F & K. Use this Beauty By Shea Organic Raw Shea Butter daily and often for beautiful, moisturized, luminous skin. 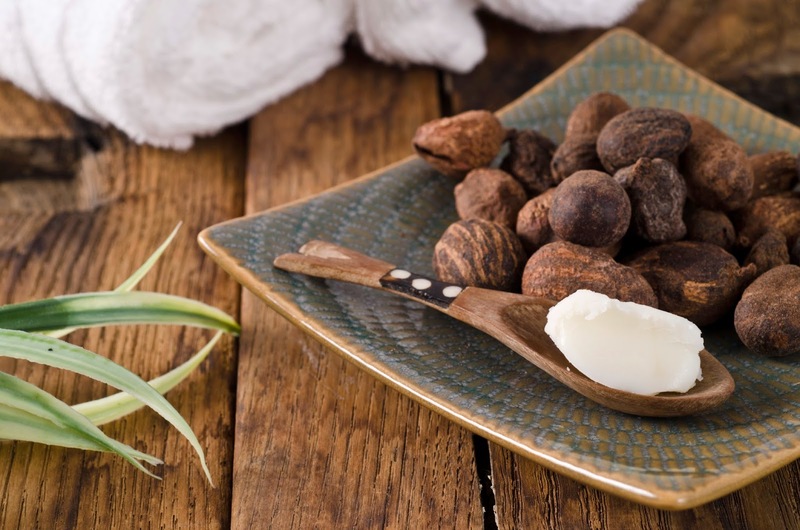 Raw Organic Unrefined Shea Butter is perfect for topical use on skin and hair, and the perfect essential ingredient for homemade lotions, soaps, conditioners and more! Why Ivory as opposed to yellow Shea butter? 1. Boiled for a longer period of time mellowing out color to more milder light. 2. Lighter – absorbing into the skin faster with extra fluff. 3. Does not change color of skin. 4. Has a more pleasant nutty smell. 5. Ivory Shea butter is traditionally beige or lighter in color." 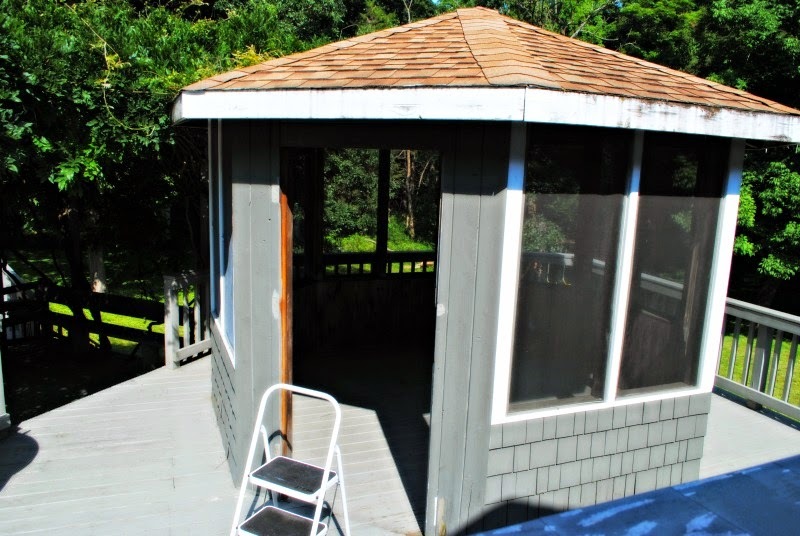 “This review and giveaway was made possible by Double Duty Divas and YesVideo. I received the featured service free of charge to facilitate my review, but all opinions are 100% mine." I have been taking part in the coolest campaign thanks to Double Duty Divas and the #DivaMemories collaboration with YesVideo. I am going to take you through the whole process and how it worked for me, yay! Super easy, a big box showed up with envelopes and a customer id card,and packaging material. I had to fill out the card which included transfer for three videotapes or movie film reels onto DVD. I used the packaging material to place the three VHS tapes (I know, I know..but we used to have a BetaCam video camera when I was a kid!!) in the EasyShip Kit and then sealed the box. Postage was already included so I dropped off my video kit at my nearest UPS drop off location and got ready to wait for my package. A few weeks later, a box arrived on my doorstep with my transferred Dvds and my original vhs tapes in separate envelopes and ready to watch. So easy, and so wonderful. My preserved memories are now safe and sound for me to share with Ana. "YesVideo has been around for fifteen years, and is now the most trusted home movie transfer service worldwide. Not just online at YesVideo.com, this service is available at over 30,000 retail partners in the United States. YesVideo lets you preserve & relive your home movies by transferring them to DVD and online. Order online at www.yesvideo.com, or drop off your order at one of our partnered retailers - including Costco, Walmart, Sam’s Club & CVS. Free online viewing, sharing and editing with every transfer. take Snapshots from your home movies. 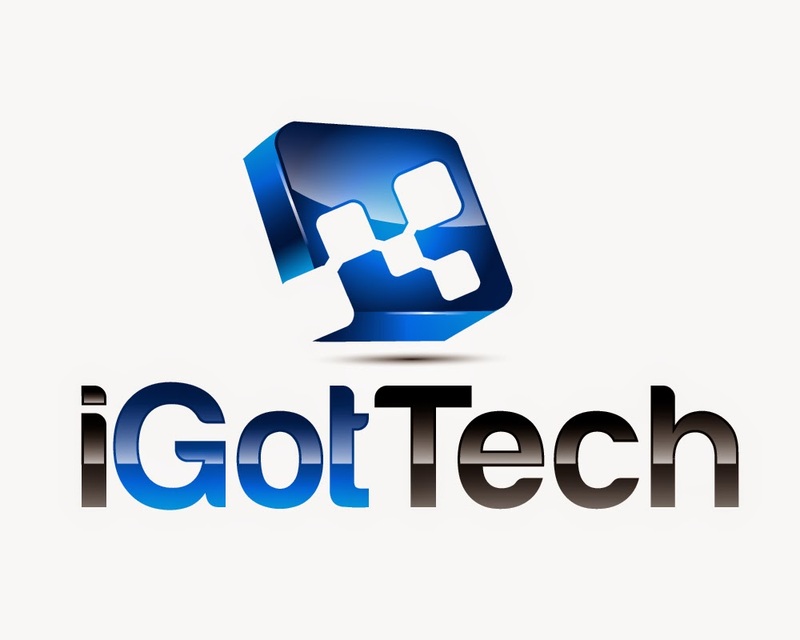 Includes automatic smart chapters and highlighted videos. Order additional copies online to give as gifts. code YVBLOG20. Valid through 9/31/14. Keep in mind that this is a best of video with soundtrack...my actual video was over an hour long. This is the highlight to share with you, my readers. I actually got tears in my eyes when I was watching my videos with my grandma H in them. She passed away some time ago in her 90s, so I really miss her and all of my grandparents. This is such a lovely way to keep those memories and watch them over and over and I hope to share them with Ana someday. (and some with you). I have to sort through them first. There are a lot of memories in there. 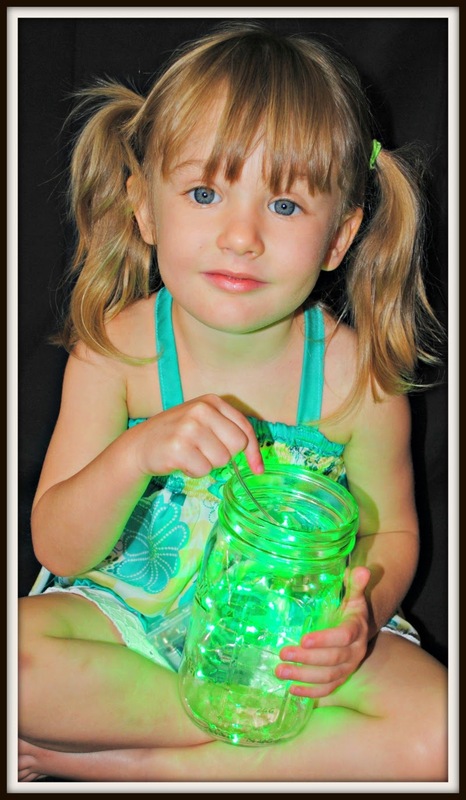 Ana and I always love new and fun things to play with and these 20 LEDs Micro LED Battery Operated String Lights are perfect for fairy lights. 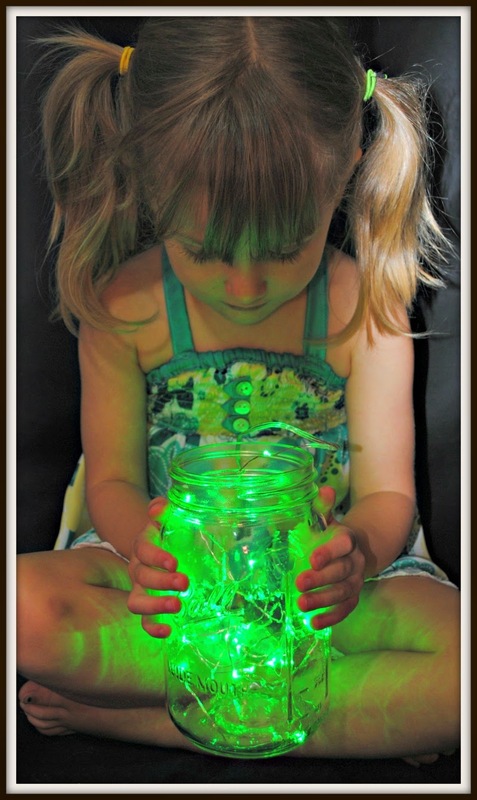 As soon as I saw them and how small the wire was, I knew I wanted to put them in a pretty clear jar and make some lights for Ana's room.
" 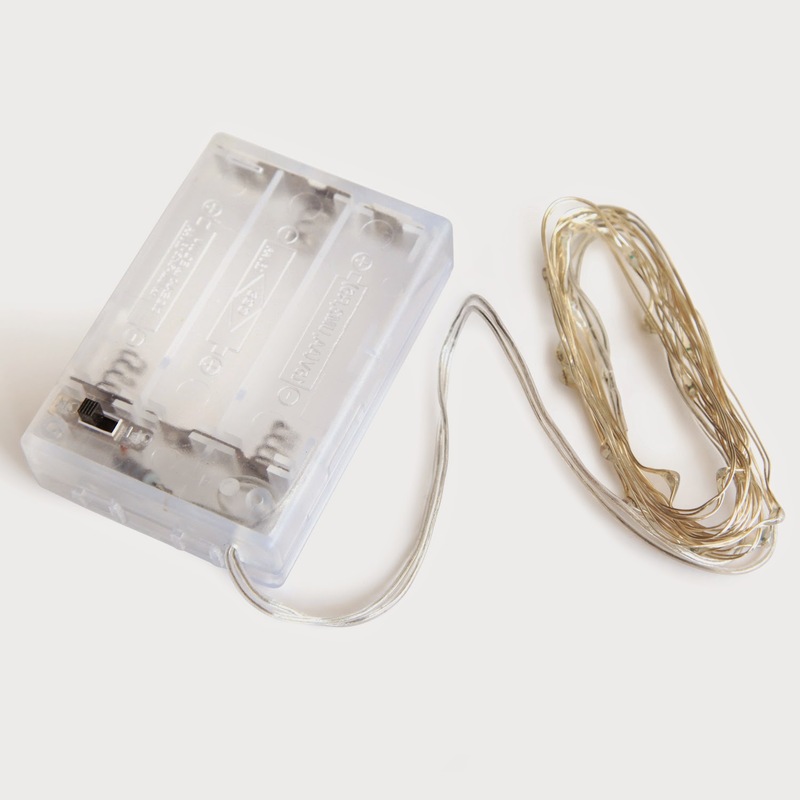 Very thin wire that hosts 20 very small LED bulbs that are about size of the rise grain and are intensely bright. With steady 360 degree viewing angle they illuminate in every direction. When used with new batteries they last for over 48 hours. 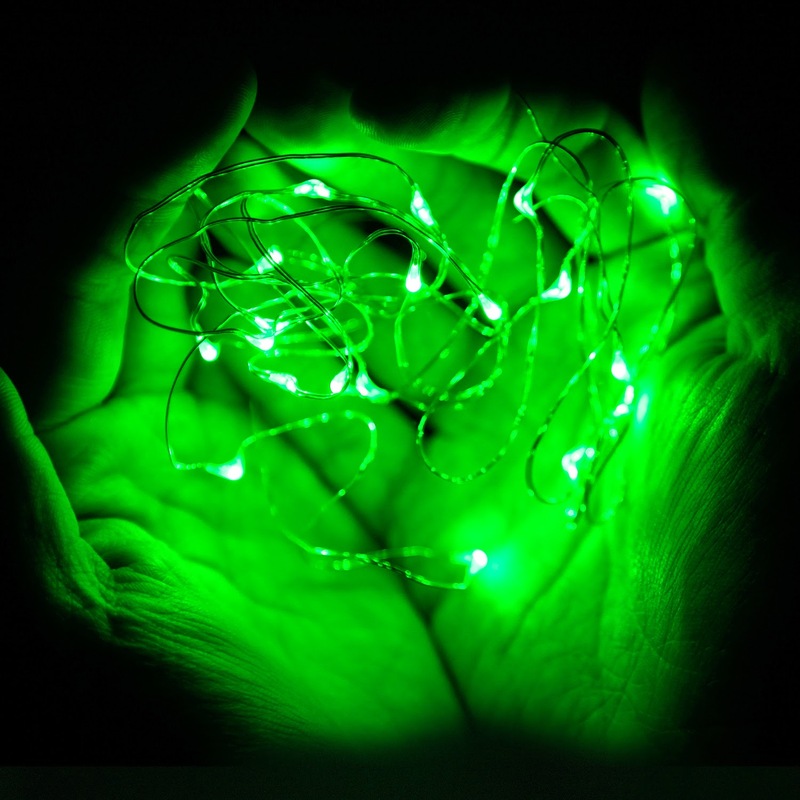 They are easy to hide, give beautiful true color and use a fraction of energy needed by regular light strings. These lights are also defined :Starry String Lights or Fairy Lights." Checking out the new menu!! Hmmm what to order? 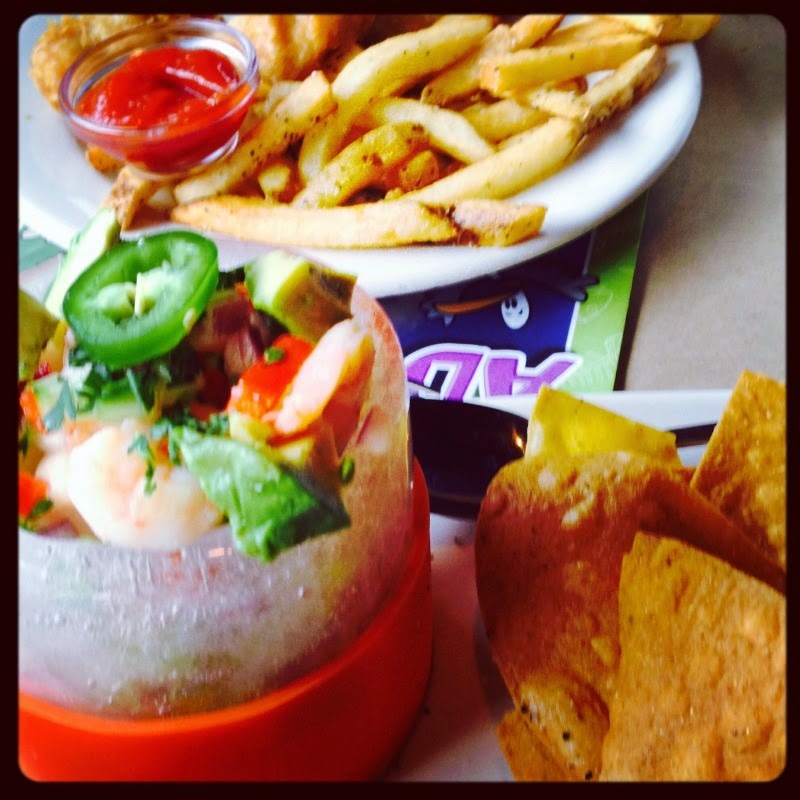 I started with the new Cold Snap Fresh Ceviche (served in a frozen glass made of ice): chilled bay scallops,shrimp, fresh fish, vegetables, avocado, cucumber, jalapeno, citurs, cilantro and warm tortilla chips!! Yum, this is totally up my alley! 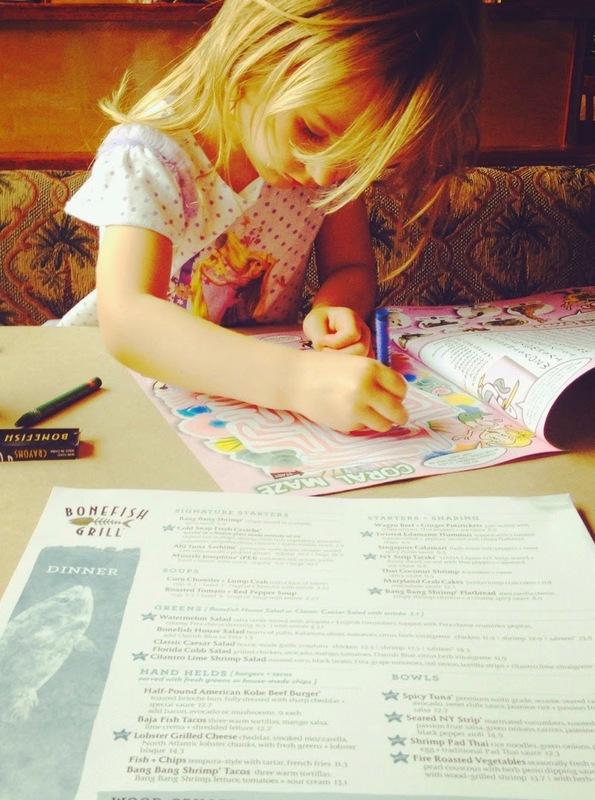 (Ana ordered the fish and chips from the children's menu and then had vanilla ice cream for her birthday dessert). And....amazingly (since I really rarely eat bread or cheese), I indulged and ordered the : Lobster Grilled Cheese!!! OMG, tender and delicious. This was such an amazing treat. 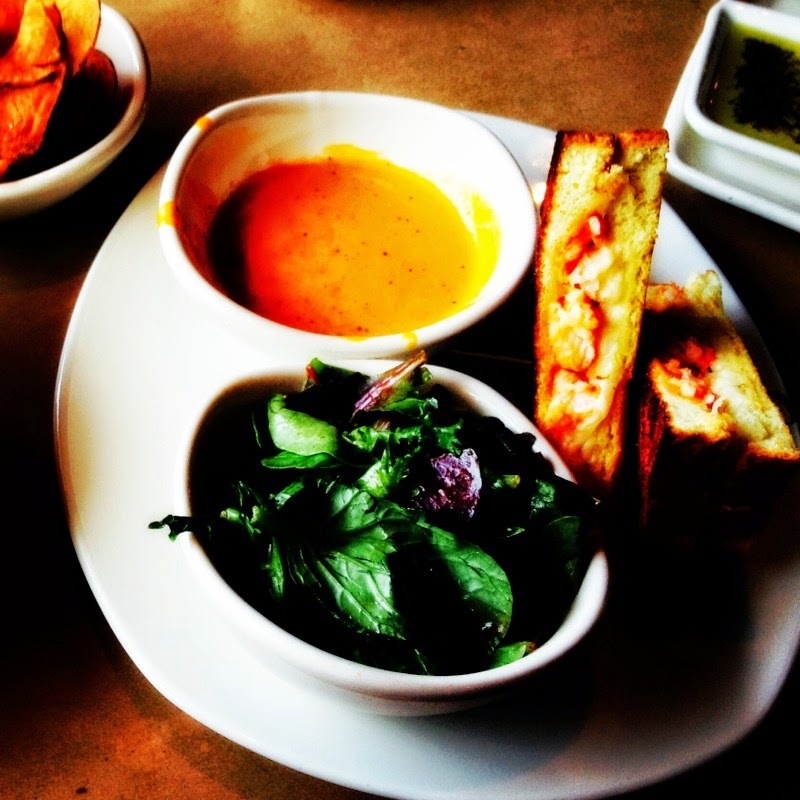 Cheddar, smoked mozzarella, Maine lobster chunks, with fresh greens and a side of lobster bisque. Also with a side of homemade chips and they were fab too!! 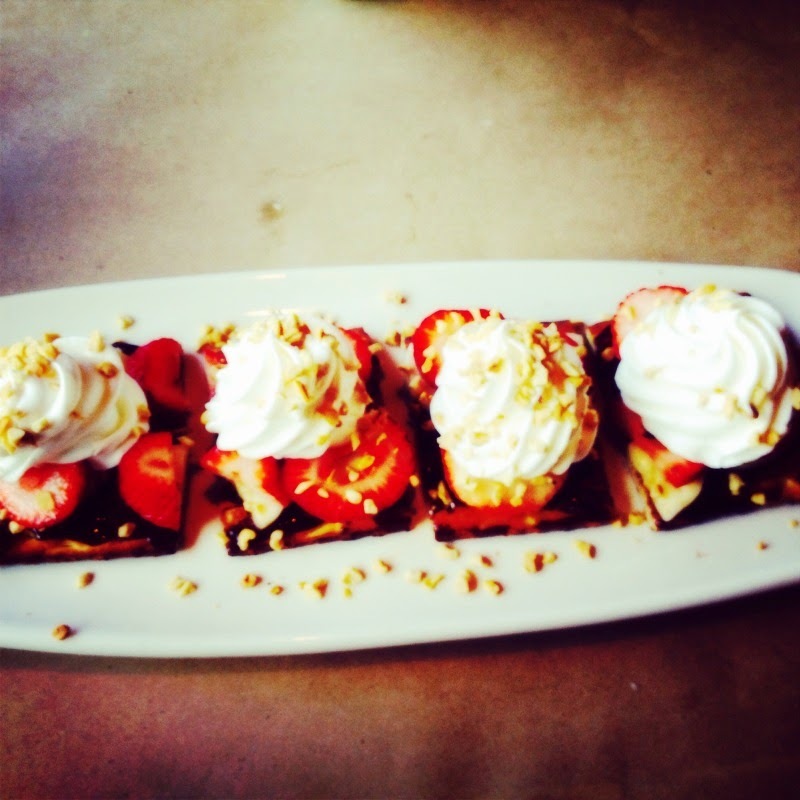 Then, I could not leave without something sweet, so I ordered something I thought Ana would want to share: Flatbread with chocolate ganache spread, strawberries, nuts, bananas and whipped cream. 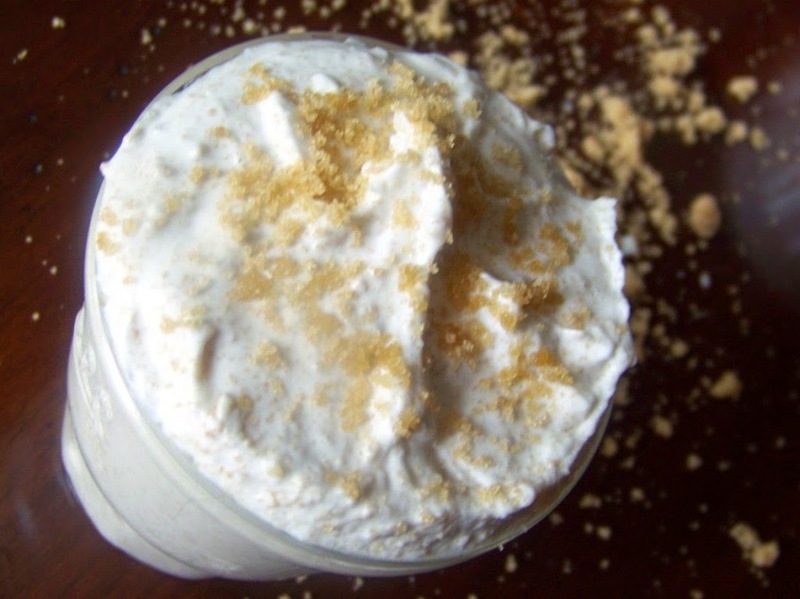 Delicious and indulgent. I ate most of the fruit and Ana had the "cream"and chocolate. 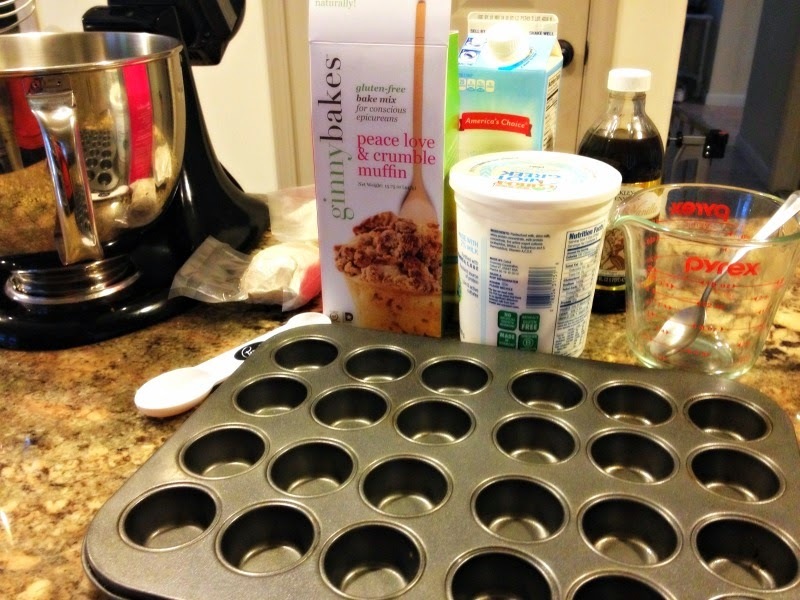 Review: Ginny Bakes Gluten-Free Organic Non-GMO goodies: brownies, muffins,cookies and bars!! YUM!! I received this product for free from the sponsor of the Moms MeetSM program May Media Group LLC, who received it directly from the manufacturer. As a Moms MeetsSM blogger, I agreed to use this product and post my opinion on my blog. My opinions do not necessarily reflect the opinions of May Medai Group LLC or the manufacturer of the product. I used Non fat yogurt instead of Butter, and they are so delish! A great bite of appley goodness. Want to know more about this amazing product? "Ginnybakes is a family-owned company, whose passion is to create outrageously delicious and nutritious treats that everyone can enjoy. The founder, Ginny, is a holistic nutritionist, who believes that your body deserves only the finest ingredients, so she’s made sure that’s the only thing they put in each of their products. Members of their team work tirelessly to deliver a wide range of outrageously delicious cookies. • ginnybakes offers a line of scrumptious chocolate chip cookies made with tempting dark chocolate. • ginnybakes’ coconut oatmeal bliss line is made with organic coconut blended with dark, organic raisins, crispy whole walnuts, and gluten-free rolled oats to make the perfect oatmeal cookie with a tropical twist. 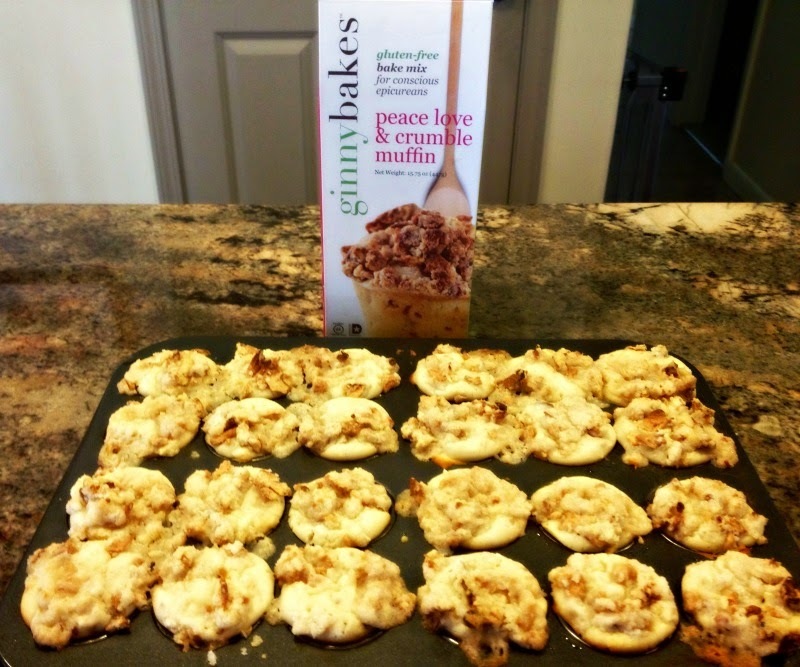 • You won’t find any artificial ingredients in ginnybakes cookies. 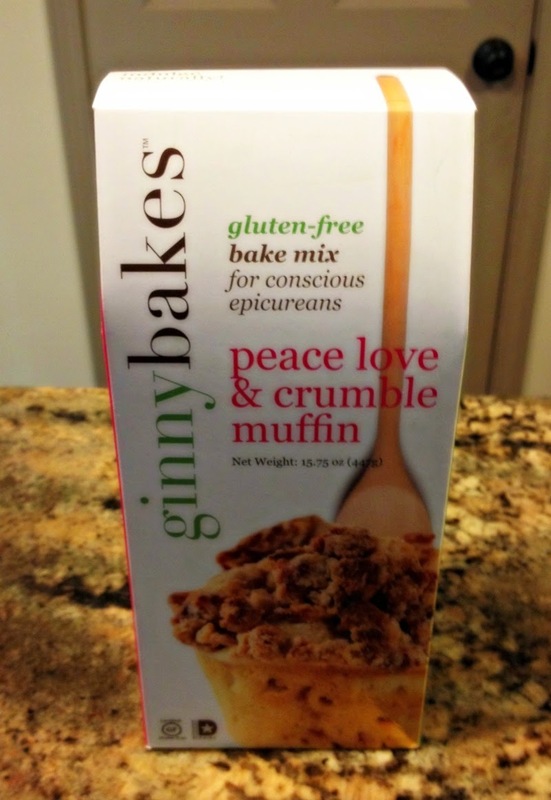 • Every product from ginnybakes is gluten-free, organic, non- GMO, and kosher. They also offer a line of totally vegan treats. 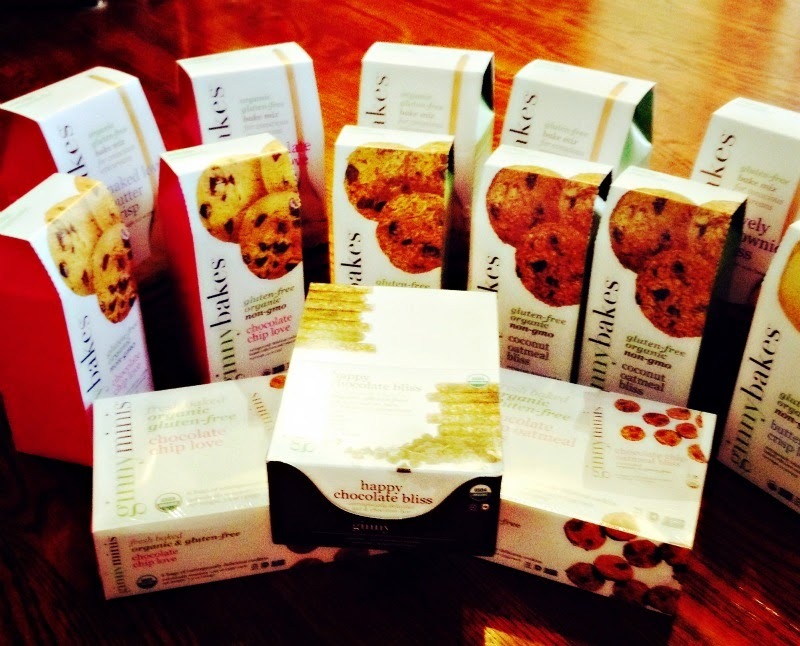 • ginnybakes produces cookies, bars, crumble snacks, and baking mixes—to fit each every one of your cravings. • The retail price for a 5.5 oz box of ginnybakes is $5.99, the price is the same for a case of their mini boxes. 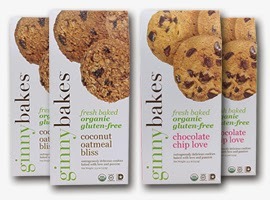 • ginnybakes products are sold at Costco stores in the San Francisco Bay Area, Whole Food Market stores, and Fresh Market. They recently found their way into Stop & Shop, Giant, Martin’s, Big Y stores, and Peapod for those who live in the New York and New England region! Use the store locator on ginnybakes.com to find even more ginnybakes locations. access to discounts and special offers! I love trying new supplements, vitamins and delicious additives to my food to be the healthiest mama I can be. So, when I make smoothies, I love to add flax seeds to give the fruit and nut milk mix some oomph.I have used other kinds of flax in my cooking and baking and love adding this super food to yogurt, and other delicious dishes. Yum! And the benefits of flax? Amazing. 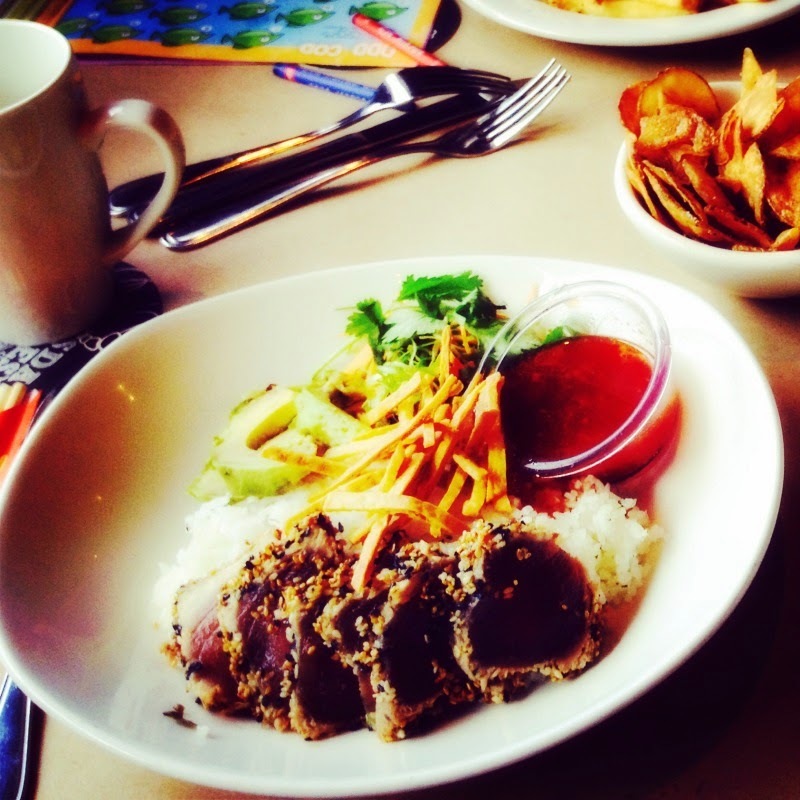 So affordable, crunchy and fun to eat. An easy add for great health! 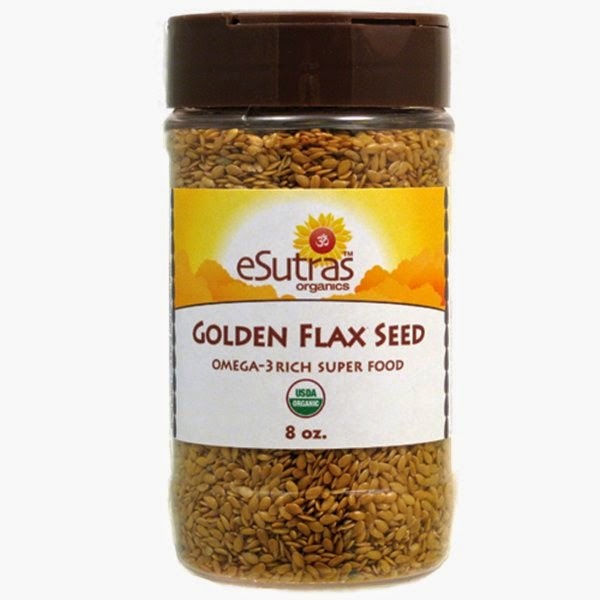 From the company eSutra: "The benefits of Flax seed include helping heart disease and lowering cholesterol. Its high content of alpha linoleic acids has made the ancient flax seed become our modern miracle food. 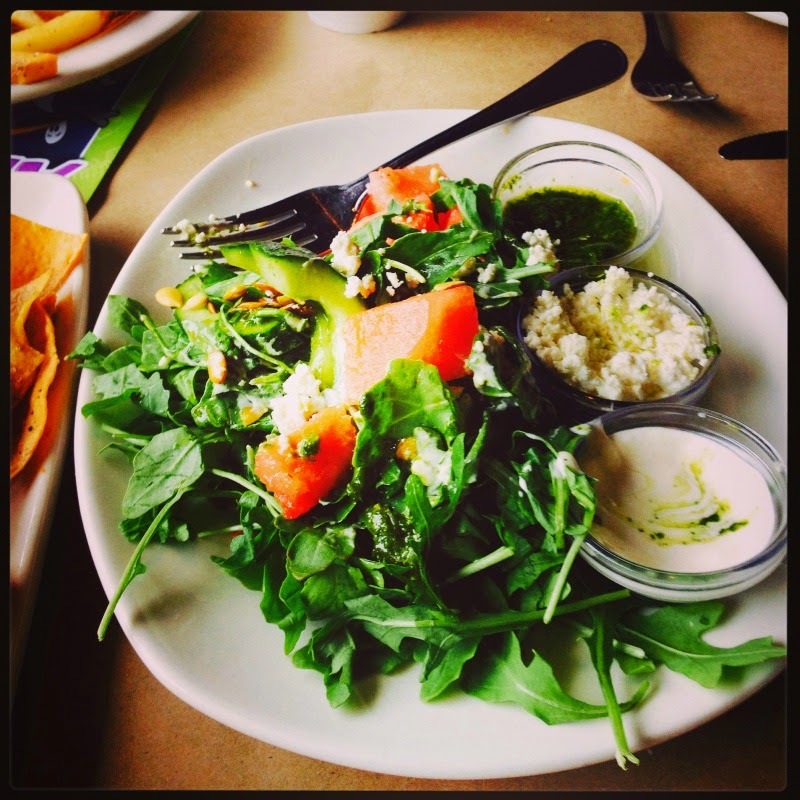 Alpha linoleic acid is a type of omega 3 fatty acid, similar to those found in fish such as salmon. Benefits of flax seed as shown in many studies include lowering total cholesterol and LDL cholesterol (the bad cholesterol) levels. Grind flaxseeds in a coffee or seed grinder in order to enhance their digestibility and therefore their nutritional value. If adding ground flaxseeds to a cooked cereal or grain dish, do so at the end of cooking since the soluble fiber in the flaxseeds can thicken liquids if left too long. Sprinkle ground flaxseeds onto your hot or cold cereal; add flaxseeds to your homemade muffin, cookie or bread recipe. To pump up the nutritional volume of your breakfast shake, add ground flaxseeds. To give cooked vegetables a nuttier flavor, sprinkle some ground flaxseeds on top of them. You can even add a tablespoon of flaxseed oil to smoothies to give a delicious treat a fiber boost! USDA – Organic"
I have pretty sensitive skin and do not like to use products that have a lot of perfume-y ingredients or strong scents. When I wash my fash, I do not want to dry out my skin, or make it uneven and prone to breakouts. This Alpha Hydrox Face Wash is gentle, does not dry out my skin and it is perfect for my 40 year old facial sensitive skin. I love it. And now you can too, since I am giving a bottle away in the easy to use rafflecopter giveaway below!! Check out how you can earn extra entries!! Non-drying formula gently cleanses away makeup, dirt and environmental pollutants. Leaves skin soft, smooth and at the proper pH level to assure optimum results when used in conjunction with Alpha Hydrox AHA treatment products. With warm water, lather cleanser between palms. Massage over face and neck. Rinse thoroughly. Pat skin dry. Use twice daily (morning & evening) followed by Alpha Hydrox Toner-Astringent (if needed) and the Alpha Hydrox anti-wrinkle products & moisturizers of your choice. Alpha Hydrox Foaming Face Wash is the perfect clarifying cleanser for the whole family! Every skin type can use this gentle, oil-free, pH balanced cleanser. Foaming Face Wash gently cleanses while maintaining skin's moisture level. Leaves skin feeling soft, smooth and fresh from head to toe! 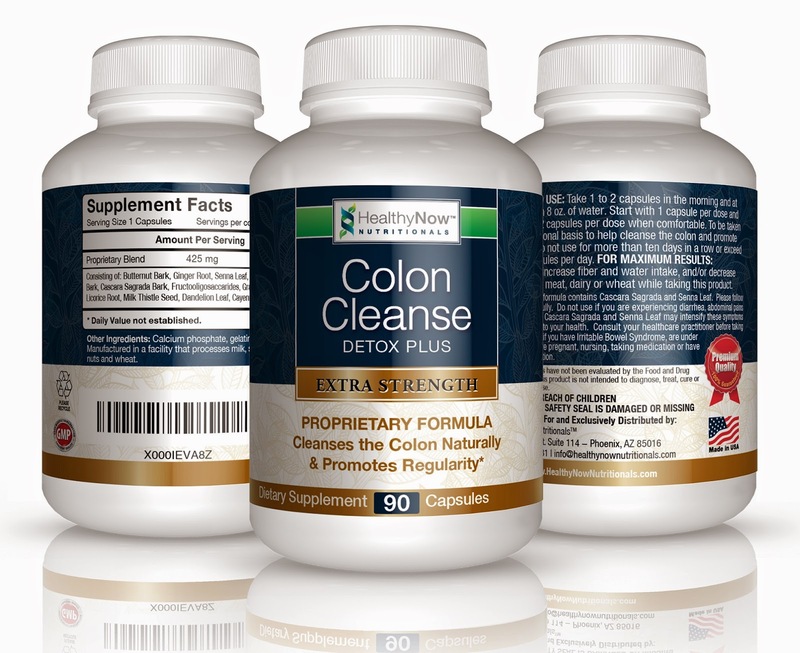 I feel wonderful while using this amazing Colon Cleanse. I take a Colon Cleanse in conjunction with a clean eating plan, Paleo and I am a pescetarian. Also, I workout about 4 days a week. So I like to be healthy inside and out and with this Detox, I feel so clean, healthy and happy. There are no bad side effects, and it works well! I am regular and feel so wonderful!! I highly recommend this detox to keep you on the right path for weight loss and healthy colon health. 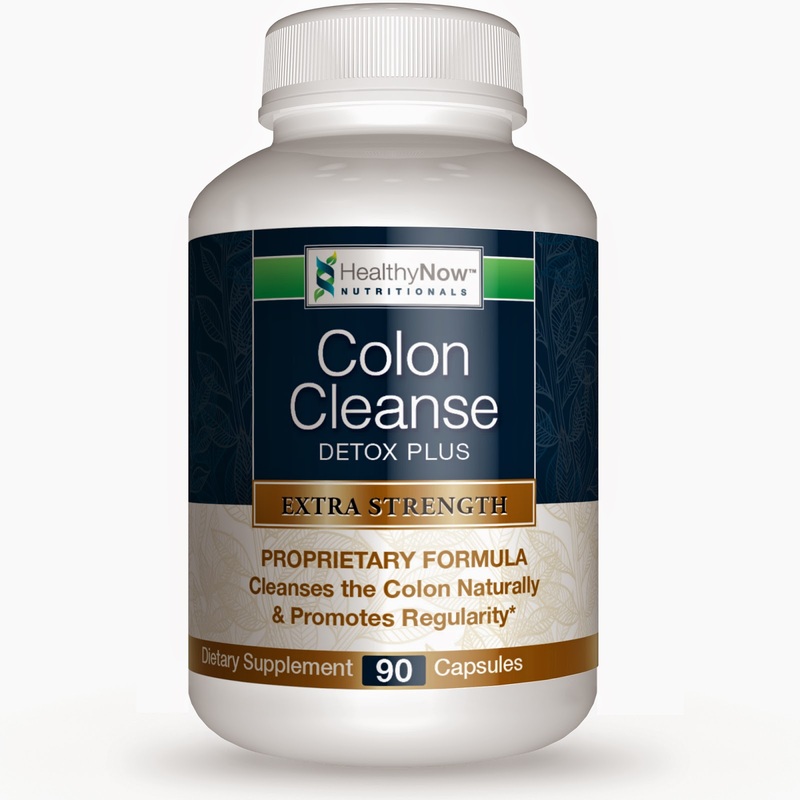 Cleanses, Stimulates & Nourishes the Colon - 90 Caps per Bottle. Promotes Digestive Health and Healthy Colon Cleanse Weight Loss. Mild but Extremely Effective Laxative - Relieves Constipation & Indigestion. Simple colon cleansing promotes a fresh & clean digestive system and enhanced colon health. Helps Eliminate Built-Up Waste. Our all-natural digestive system cleanse is Made In the USA in a GMP, FDA inspected facility and is backed by our 100% Money-Back Guarantee. Natural Detox Cleanse - NO Fillers, NO Binders, NO Artificial Ingredients. Enjoy this fast acting colon cleanse for constipation relief. When buying colon cleansers always use only natural herbal ingredients. I love oils. And now that I am 40, I will try everything to keep my skin young and healthy and looking great. I have been using Mia Mariu's other products including their makeup for some time now and they are wonderful. AND, Full of minerals and great, natural ingredients. "Mia Mariu’s NEW Skin Nourishing Oil with invigorate your senses and rejuvenate your body with nutrient rich replenishing oils. Our Skin Nourishing Oil contains oils from Sweet Almond, Avocado, Wheat Germ, Safflower Seed, Soybean, Lemon, Orange and Grapefruit - essential for keeping your skin firm, smooth and luminous. It is also rich with botanical extracts like Chamomile, Cucumber and Lavender that provide anti-inflammatory, moisturizing and healing support for your skin. The Skin Nourishing Oil provides deep penetrating soothing moisture that rejuvenates the skin without blocking pores. It helps prevent signs of aging by promoting collagen production which helps keep the skin young and supple looking. Alcohol free, Sulfate free, Paraben free. Suitable for all skin types and ages. 4 fl. oz"
I love the scent. Lemons? Yes! Oranges? Yes!! Sweet Almond, Avocado and Wheat Germ?? Yes, Yes, YES!!! Fabulous. "The Mia Mariu philosophy makes the connection between beauty and health inside and out. Mía Mariu’s high performance products are formulated with the most natural ingredients available helping you achieve vibrant beauty and health inside and out. Each unique product fuses nature and technology by combining the highest quality botanicals, antioxidants, vitamins, minerals and peptides. The result? healthy products that provide a perfect balance that reflects itself through youthful, healthy, beautiful, glowing skin and renewed energy and vitality, at an exceptional value. Mía offers natural skin care, professional makeup artist quality mineral cosmetics and brushes, fine fragrances and nutritional supplements to Reveal Your Unique Shade of Beauty!" Wonderful, and my skin looks amazing and youthful. I love this company!! Soo...the good stuff...want to win a bottle?? Check out the links below and then enter to win in the rafflecopter form! Lots of entry chances. This door is so cool and so easy to install. I love it. It made my party so much easier to navigate and kept the bugs out of the food!! Want to buy one??? Check out the links and info below for more info and buy one at Amazon!! 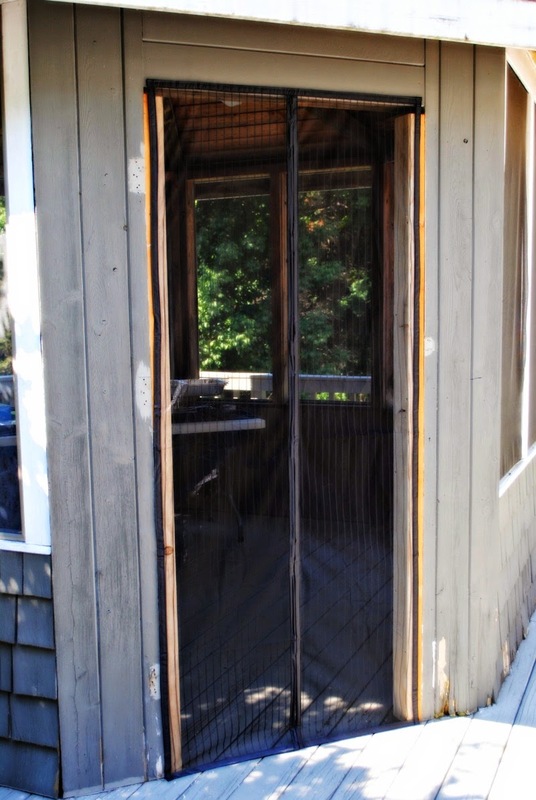 "1) MAGNETIC SCREEN DOOR NIRVANA. 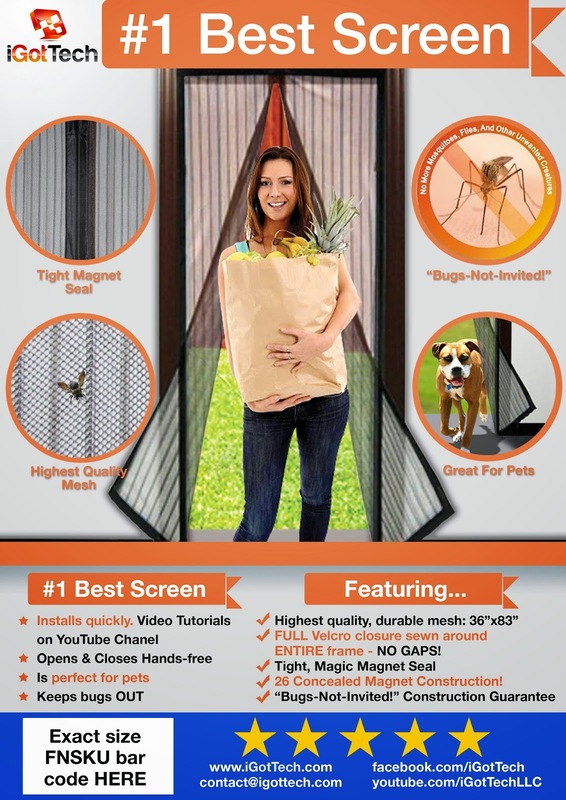 If you've tried other flimsy magnetic screen door before, you'll notice the difference right away. #1 Best Screen has toughest, heavy mesh construction. Mosquitos and biting bugs stand no chance. 5) OUR INFAMOUS "BUGS-NOT-INVITED" CONSTRUCTION GUARANTEE. If our #1 Best Screen construction quality, or anything about our product is not up to par: WE WANT TO KNOW. Our Top Priority is your satisfaction, and stand behind our products 100%. That means if you don't like it, you can return it for a FULL refund, no questions asked. Simple as that! No Risk trying this Premium Product Today."